Gaetano Berardi, in ocntention for a recall. After bouncing straight back from their first league defeat with a battling win at MK Dons last Saturday Leeds United now face the biggest test of their away form so far when they travel to take on title favourites Middlesbrough. The 2/1 favourites to win the Sky Bet Championship stand just behind early leaders Brighton with five wins, two draws and just one defeat so far and appear to be carrying on where they left off last term when only narrowly missing out on promotion. Aitor Karanka’s men go into this Sunday’s game with Leeds on the back of five straight victories in all competitions and having scored at least two goals in each of those five matches. United remain unbeaten on their travels under Uwe Rosler, however, and have scored two goals in each of their last three away games so a good contest looks on the cards for this televised fixture. Middlesbrough’s Riverside Stadium is also one of their luckiest grounds and they have only been beaten once in their last 13 away games against Boro. Leeds did the double over Boro last season so while they will not have any fear of travelling north they also must know that there is little chance of Karanka underestimating them. It is likely the hosts will be facing a 4-3-3 formation after head coach Rosler restored it at MK Dons. 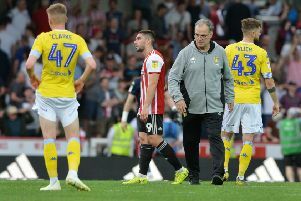 A similar side will take the field at the Riverside, although Gaetano Berardi could return at right-back in place of Scott Wootton after it was confirmed he was just rested for a game last weekend. Rosler has another selection decision to make in midfield after leaving Tom Adeyemi out at Milton Keynes with Luke Murphy, Alex Mowatt and Lewis Cook restoring their partnership from last term. New winger Jordan Botaka has yet to feature for a minute in the first team, but is likely to remain the team’s secret weapon on the bench. Rosler was pleased with the three points brought home from the MK Dons game and hoped his players had learned some lessons as they almost let a two-goal lead slip for a second time despite their opponents having a man sent off 13 minutes from time. He said: “There were so many turns and twists in the game. We were 2-0 up at half-time and it was a great position to be in coming into the second half. “The way we managed the game in first 15 to 20 minutes of the second half was impressive and we could have easily scored in that period. “But then the panic button set into play, even with a man more. All credit to MK Dons, they made some tactical changes. They put (Carl) Baker in the right-back position and he put ball after ball into our box and they got momentum with some corners. “It was difficult for us to get the ball down and play and use our man advantage. “But in this league, you need to find a way to win, even when you are not playing pretty over ninety minutes which is what we did. Leeds, meanwhile, will have another winger to choose from next week when Will Buckley joins the club on a 93-day emergency loan from Sunderland. Capable of playing on both flanks, Buckley will add competition in the wide areas and enable Rosler to keep his 4-3-3 formation.